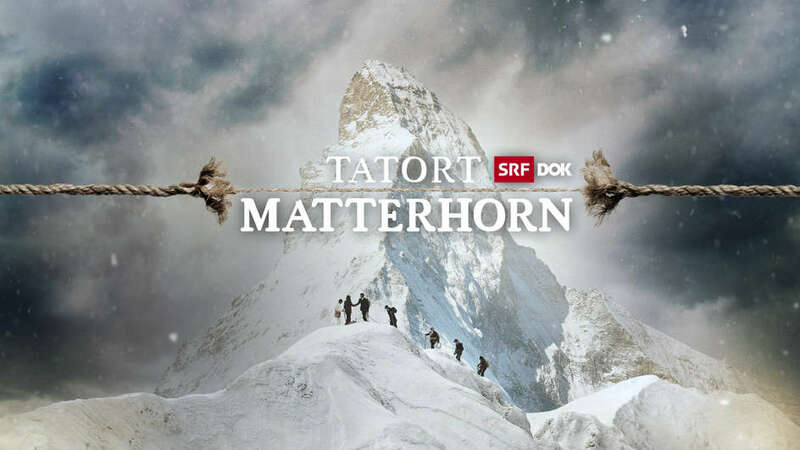 25 Aug 2018, 3:24 p.m.
Tatort Matterhorn titlecard, via SRF. Tatort Matterhorn, or Crime Scene: Matterhorn in English, is a documentary by the Swiss national broadcaster, SRF, about the 1865 first summit of that mountain. An ad hoc team of seven, led by the British climber Edward Whymper, narrowly beat an Italian group to the peak. On their way down, however, four of them fell from the rock and died. Tatort Matterhorn draws together a number of disciplines to examine this combined success and catastrophe. A range of talking heads weigh in: mountaineers, historians or, often, both. The expedition is recreated by a well-cast set of actors in period dress, which looks perilously thin to my modern eyes. Finally, we follow the adventurer Pen Hadow as he visits Zermatt and the Matterhorn—and the remaining forensic evidence. Hadow is a great-grandnephew of the young climber Douglas Hadow, whose slipping foot was blamed for bringing himself, Michel Croz, Reverend Charles Hudson and Lord Francis Douglas to grief. Although he counts his famous relative as an inspiration, Hadow believes he was a convenient scapegoat for the disaster and would like to see his reputation cleared. Though skeptics like me may be inclined to shrug off Hadow’s quest as a cheap way to bring modern human interest into the documentary, I didn’t find that quality was at all sacrificed for accessibility. (Another reason to be glad that the No Billag initiative didn’t pass!) Production standards are high throughout. The film uses multiple British experts, chief among them the mountaineer and researcher Stephen Venables, but its real strength is in its Swiss sources. Othmar Kronig, a former mountaineer from the same region as two of the party—the mountain guides, Peter Taugwalder father and son—speaks often. His local knowledge and firm opinions are backed up by an ernest delivery, and the most memorable line of the film, for me, is his. Through the reenactments of the group’s assault on the mountain, via its nearly vertical North face, we see just what it meant to be ready for the Matterhorn. Arguably, none of the men were truly prepared for it. They were companions by chance, climbing together largely because it would have been still less efficient to compete with one another (Whymper, Douglas and the two Taugwalders vs. Hudson, Hadow and Croz) as well as the Italians. Still, I was appalled at the revelation, near the end of the film, that Hadow’s boots lacked nails in the soles for grip. 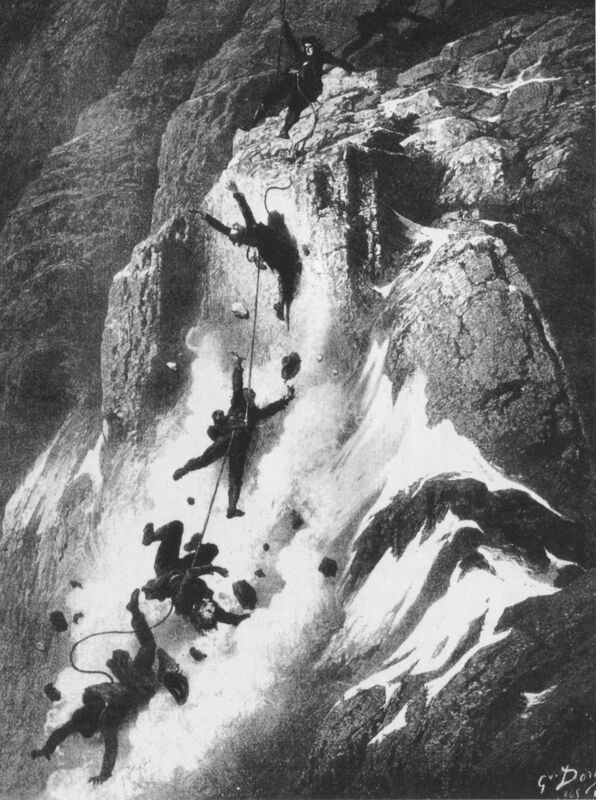 The Matterhorn disaster, Gustave Doré, via Wikimedia Commons. The question above all, of course, is this: what led to the breakage of the rope between the four men who died, and the three who survived? Tatort Matterhorn considers the obvious two explanations first. Either it frayed and then snapped as they fell, or someone cut it deliberately. Or, and this is where the filmmakers claim to have found new archival clues, the team’s strongest rope had already been cut, leaving Taugwalder Sr no choice but to join the two groups with a thinner rope that would never bear the weight of the four if they slipped. The documentary reaches its most interesting at this point. It contrasts the evidence given by the survivors—in two hearings, letters and Whymper’s later memoir, Scrambles Amongst the Alps—with the results of modern experiments. It also looks into their possible motivations, and the huge advantage in power and literacy that Whymper had over Taugwalder Sr. Initially, Taugwalder Sr’s account of the accident was believed by his community. (One of the nicest, and most Swiss, segments of the documentary shows the men of his village drinking and discussing the case outside his hut.) By the second hearing, he’d adjusted it to more closely match Whymper’s story; nonetheless, Whymper’s memoir put the blame squarely on Taugwalder Sr’s shoulders, and it ruined his life. Left: Title page of Scrambles Amongst the Alps by Edward Whymper, via Wikimedia Commons. Right: Peter Taugwalder's house today, by Adrian Michael [GFDL or CC BY 3.0 ], from Wikimedia Commons. 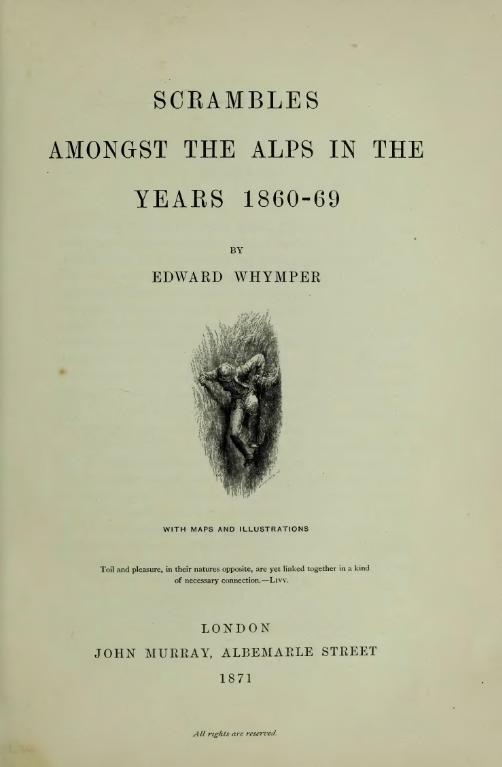 Edward Whymper himself achieved fame and social status for the ascent, and lived until 1911, but according to Tatort Matterhorn, his was a lonely and embittered later life. Of the survivors, Taugwalder Jr, who was in the last position on the rope and thus couldn’t have doomed or saved the falling men, had the simplest fate. He kept working as a mountain guide, summitting the Matterhorn 25 times and earning the nickname ‘Matterhorn-Peter’. If you’re able to watch the documentary, which is all in Swiss German, I do recommend it. It's hosted on archive.org here. For a marvellously spooky tale inspired by the same events, read The Mountain Grave by Adam Scovell!